A former Fortune 50 Chief Marketing Officer, Beth Hirschhorn founded iCommercialize, a marketing and strategy consultancy, to ensure that what a company brings to market, succeeds in market. With more being asked of marketers, rising consumer expectations, and internal company complexity, businesses access Hirschhorn’s proven processes and approaches. Hirschhorn is a practitioner, who has been held accountable for bottom-line results; she has a record of accomplishment spanning new product development, brand expansions, customer experience overhauls, multi-media promotions and global sponsorships and more. Before starting iCommercialize, Hirschhorn led marketing worldwide for Kaplan Inc., the $2 billion diversified education company operating in over 200 countries. She was charged with building a premium global brand and advancing Kaplan’s digital and customer experience capabilities. Hirschhorn was a member of Kaplan’s Executive Team and served on the Investment and Capital Allocation Committees. As Kaplan’s first-ever Chief Marketing Officer, Hirschhorn led a complex and comprehensive brand positioning initiative, integrating decision-grade quantitative consumer research conducted in nine countries and across 17 business segments. The result is a distinctive and unified strategic positioning: Through innovative learning experiences delivering real-world value, Kaplan gives people an edge in a competitive world and encourages them to invest in their ambition. 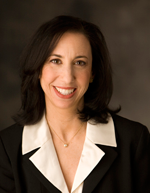 As an Adjunct Professor of Marketing at NYU’s Stern School of Business, Hirschhorn delivers the course she authored: Marketing Strategies for the Service Economy. Her modern-day curriculum focuses on the unique characteristics of services businesses compared to packaged goods or manufacturing businesses and the tactics required to drive customer and shareholder value. She encourages her student marketers (many of whom become mentees) to shift their resources and mindsets from an acquisition-only orientation to being retention and lifetime-value focused. For the past twenty years, she has been an Ambassador for the Cornell Alumni Admissions Network, meeting one-on-one with high school students and putting a human face on the college admissions process. Hirschhorn is a member of the Women’s Forum of New York, the premier women’s organization comprised of the highest women achievers across all industry sectors. Through this organization’s international arm, she combines her expertise in Sports Marketing with her commitment to supporting women’s careers by mentoring a professional athlete as she transitions from sports to her next career. Prior to joining Kaplan, Hirschhorn was Executive Vice President and Chief Marketing Officer of MetLife, Inc. and a member of its executive group. She led several major initiatives for the company that dramatically improved the customer experience and strengthened MetLife’s reach and market share. These included a reinvention of the life insurance buying experience with a patent-pending underwriting process and expanded web and phone distribution, as well as a multi-year transformation of MetLife’s marketing mix from traditional channels to industry-leading digital, sports and entertainment marketing. Hallmarks of this include the acquisition of naming rights for MetLife Stadium – home of New York’s Jets and Giants and SuperBowl XLVIII – as well as the reinvigoration and expansion of MetLife’s advertising and blimp marketing programs internationally. These are among the reasons Sports Business Journal recognized Hirschhorn as a “Game Changer” among a select vanguard of women executives leading change in the sports industry. Hirschhorn arrived at MetLife in 2002 from JPMorgan Chase to lead an expansion of its Institutional Retirement & Savings division. In this role, she developed and managed a broad range of income and retirement products for companies in need of quality products and employee benefits programs. She served on MetLife’s pension policy committee, and was responsible for thought leadership and harnessing the company’s public relations activities and public policy advocacy. Hirschhorn’s experience as a Board Director began with her service on the board of Maestro International, the online debit network now owned by MasterCard. She served a three-year term on the board of Hyatt Legal Services, a MetLife subsidiary. For over a decade, Hirschhorn was an Advisory Board member at the Wharton School of the University of Pennsylvania’s Pension Research Council. The Pension Research Council supports scholarly research, teaching and outreach on global aging, successful retirement, and public and private pensions and disseminates research findings to international audiences of academics and policy-makers. Hirschhorn was a Director for two full terms – and also the Chairperson - of LL Global, the parent of insurance industry trade groups LIMRA International and LOMA. Recent honors include being named Financial Communications Society’s Marketer of the Year and Working Mother of the Year; she also sits on Crain’s 40 Under 40 list. Television appearances include interviews on ESPN, CNN, MSNBC, Fox Business News, PBS, and as a panelist on The McLaughlin Group while print and online coverage includes Forbes, New York Times, Wall Street Journal, USA Today, Dallas Morning News, Miami Sun Sentinel, and Fortune.